This section covers the very basics to help you get started. Divio Cloud runs django CMS. If you’re already familiar with django CMS you can skip this section. You should already be logged in to your new Explorer site, with the django CMS Toolbar displayed at the top of the page. If not, add /?edit to the end of the URL to trigger the login prompt. You’re looking at the published version of your page. Switch to Edit mode, by hitting the EDIT button. Now you’re in Edit mode, you’re able to change much of the site’s content simply by double-clicking on it. When you’re hovering over editable content, a Double-click to edit pop-up will appear alongside your pointer, along with the name of the content type involved. Choose some text to amend; double-click on it. Whatever the content type, an appropriate pop-up window containing an editor will appear. For text, this will generally be the default rich text editor, which includes formatting and other editing controls. Change some text and hit Save. Your changes are reflected immediately - but only in Edit mode. Hit View Published and you’ll see that the original text, as published, is unchanged. It will remain unchanged in until you hit Publish changes. This allows you to keep editing and refining your page until you are satisfied with your changes in Edit mode, while leaving the live content undisturbed. When you’re happy with your work, hit Publish changes. The same principle of double-clicking to edit applies throughout the system, for example in the Aldryn News & Blog application too. The Blog page lists a number of articles, including a snippet of introductory text from each, along with a publishing date and the author’s name, and a link to the full article.From the navigation menu in the Explorer site, choose Blog, to go to the home page of the weblog. In some cases, for “featured” articles, a large image is displayed too. If you read a full article and switch to Edit mode, you’ll see that double-click-to-edit works here too. Double-clicking in an article’s main body of text will open the text editor as before. Double-clicking on its title on the other hand (whether on the article page, or the weblog’s home page) will open a different editor in the pop-up. In this case it’s the Edit article form, where you can change settings such as the title, date of publication and so on. You’ll notice that some content appears differently when double-clicked to edit it, or even when you simply switch to Edit mode. For example, a collection of slides in a carousel will display each slide individually, to make them easier to edit. 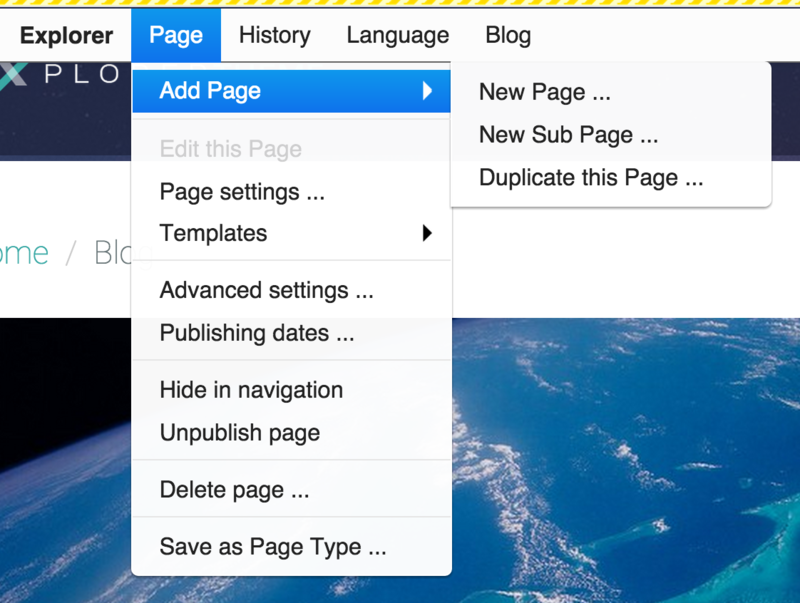 Unlike pages, weblog articles don’t exist in draft and live forms, so any changes you make are published immediately. You’ve already used Content mode, in which you can double-click on content to edit it.The Structure/Content mode control in the toolbar lets you switch between two different editing modes. In Structure mode, you can manage the placement of content within the page structure. Switch to Structure mode by hitting the Structure|Content button. When you edited text in the rich text editor, what you edited was one of these plugins.The content you were looking at will be replaced by a representation of its structure. Each block of rows represents a Placeholder, and each row represents a Plugin that has been inserted into a Placeholder. Double-click on one of the Text plugins listed in the NEWSBLOG_ARTICLE_CONTENT block. you’ll see that it’s the same kind of thing. When you select Text, the text editor will pop up as before. Enter some new text, and Save the plugin.Find the NEWSBLOG_ARTICLE_CONTENT block. Select its Edit menu, and scroll down through the list of available plugin options until you findText. You’ll see your new text plugin and its content showing in the list of plugins. Switch back to content mode; now you’ll see that the content appears on the page. 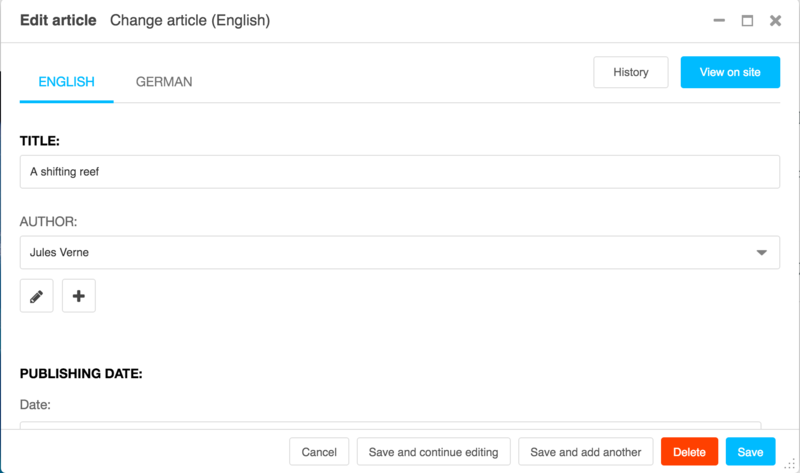 We will cover more advanced content editing later on in the tutorial, but in the meantime feel free to explore, choosing different kinds of content to edit. The pop-up indicator that appears over editable content provides information about the kind of editor you can expect to open when you double-click. Your new - and so far content-free - page will appear in right-hand pane.In the Toolbar, select Page > Add Page. Give the page a Title (you can ignore the other options for now) and hit Save . 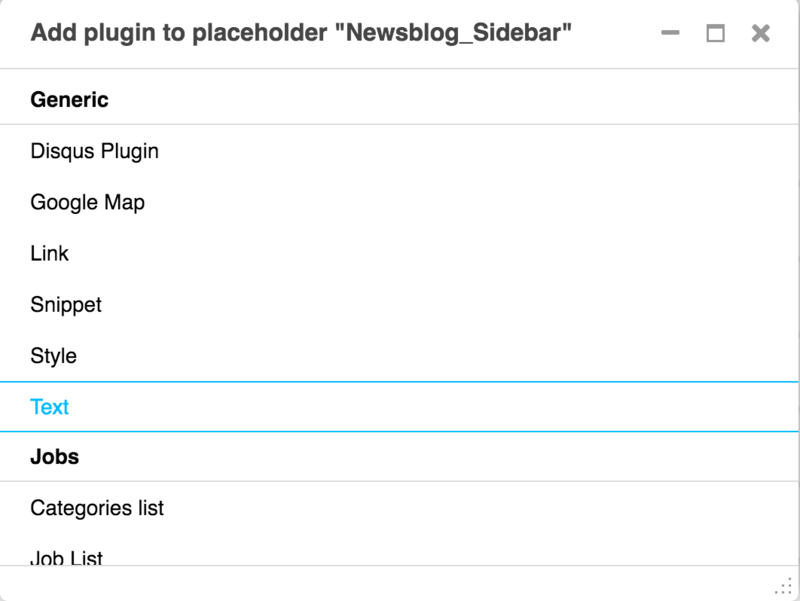 Switch to Structure mode, and insert a Textplugin into the Content Placeholder block. Add some text to the plugin, and Save. Switch back to Content mode to see your text on the site. Here you can also add New Sub Page and Duplicate this Page. Hit Publish Page now when you’re ready for it to be published.